Hu Jiaxi (in white shirt), a famous expert of bronze wares restoration, introduces the repair process of the bronze wares on display. 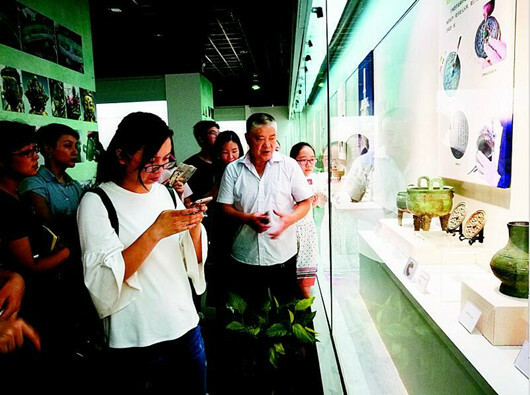 On July 17, the "Exhibition of Conservation and Restoration of Bronze Wares in Wuhan Museum" kicked off in Wuhan, capital of central China's Hubei province. As the first of its kind in Wuhan Museum, the exhibition brought together nearly 200 pieces of bronze wares restored in the museum. The process and tools for restoration, as well as comparison between bronze wares before and after restoration allow audience a more intuitive understanding of restoration of cultural relics. As introduced, the bronze wares in Wuhan Museum include unearthed objects and implements handed down from ancient times. To restore the historical value of those broken, deformed and rusty objects, the museum has obtained national financial support for preservation of cultural relics and carried out protective restoration of over 300 pieces of bronze wares. In July 2016, the conservation and restoration work successfully completed and passed national acceptance check. The exhibition will last till November.